Since 1988 a research team from the Penn Museum has been involved in making a computerized architectural and topographical survey of the Roman colony of Corinth. Known as the Corinth Computer Project, the field work has been carried out under the auspices of the Corinth Excavations of the American School of Classical Studies at Athens. 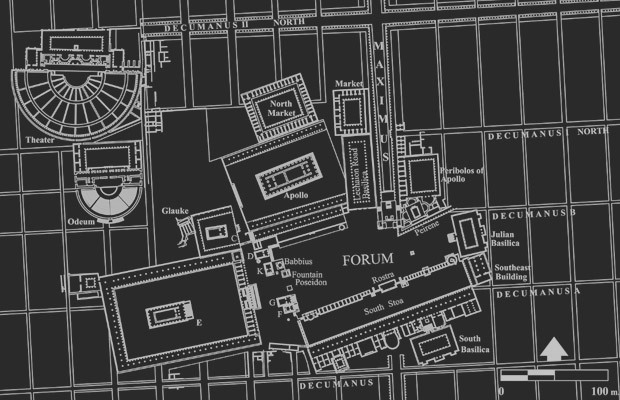 The original objectives were to study the nature of the city planning process during the Roman period at Corinth; to gain a more precise idea of the order of accuracy of the Roman surveyor; and to create a highly accurate computer generated map of the ancient city whereby one could discriminate between and study the successive chronological phases of the city’s development. During the course of the twenty years of the project to date, the nature of the research has evolved from a fairly straightforward consideration of the location and orientation of the excavated roadways of the Roman colony, to a more complex topographical and architectural consideration of various elements of the colony, including the rural as well as the urban aspects of planning and settlement. The project now utilizes a number of methodologies simultaneously in the overall study of the ancient city. One aspect of the project is a regional landscape study of a portion of the Corinthia, with the city of Roman Corinth as the focus. Another aspect of the project is the effort to include information from the city of Corinth from chronological periods other than Roman, specifically Archaic and Classical Greek, Hellenistic, Late Roman, Byzantine, Frankish, Venetian, seventeenth through twentieth centuries.